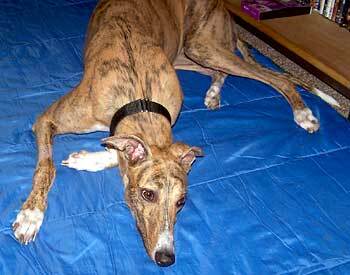 Layla, (formerly Gabby), aka CL Hold Me, is a beautiful almost 4-year-old light brindle female, born on May 7, 2004. 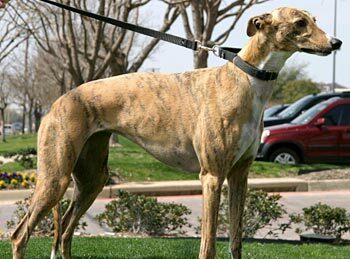 Layla's dam is Deco Annette and her sire is Gable Dodge, sire to 8,172 greyhounds. 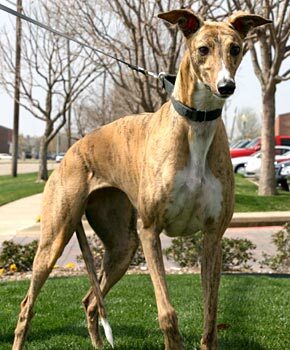 Gabby's lineage boasts three generations of very famous Greyhound producers. Both of Gabby's grand-daddies are well known in the racing industry; Molotov is credited with 7,197 offspring and Wigwam Wag with 2,855. Looking back to the previous generation, another set of very famous sires is uncovered. Layla's great-grand-daddies are HBs Commander, credited with 2,360 offspring, and Dutch Bahama, with 1,846. In addition to producing racers, Dutch Bahama is well known for passing a gene for gorgeous eyes, and the very-seductive Miss Layla is adept at charming her human suitors with just the bat of an eyelash. Layla's racing career never got off the ground. She had to retire after 12 races on March 10, 2006, because of a broken tarsus, a bone that is part of the ankle joint. After this injury healed, Layla was adopted into a home, but unfortunately it was not to be her forever one. Layla is cat tolerant. 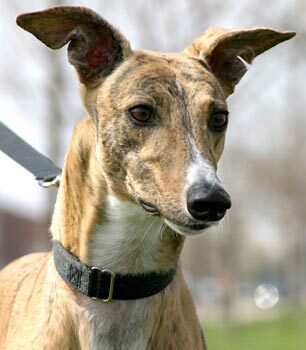 You could go a long time before you meet another greyhound as gorgeous as Layla. She is a light tiger brindle, with white in all the right places. A streak of white starts between her eyes, broadens at her nose and then wraps around to her lower jaw. The white becomes a blaze that continues across her abdomen. She has four white socks and shoes, a white tip on her tail, and one white dot on the back of her neck. Layla is a people dog. She likes to be wherever her people are. While she'll willingly, in fact enthusiastically, go outside, she is the first one in and comes when called. Actually she'll come in even when another dog is called. She'll go to bed first so that she can claim the bed closest to people. Layla has been a perfect house guest. She'll ask to go out and then ask to come in. She loves to go on walks, is well behaved and easy to walk on a lead. Where once she was a little too enthusiastic about getting ready for walks, she now has learned to wait patiently for her lead without bouncing. She loves meals and snacks, and there too, she is learning to wait patiently. She loves chewing on rawhides, plays with squeaky toys, but has never destroyed or chewed on anything inappropriate. She appears to be a smart girl who already understands that "cross" means "let's cross the street." If you offer to run and play with her, she eagerly joins in the fun. Layla would like to be a bit bossy, but she'd rather please. She has a considerable vocabulary of sounds and tries them all to get your attention. She has quickly learned that if we ignore her, she might as well give up. Of course, she is also smart enough to know that laying her head by yours, or slathering you with kisses, are also excellent ways to get your attention. Layla would do best in a household without younger children. At a recent meet and greet, passersby and prospective adopters did, in fact, notice Layla's gorgeous eyes and beautiful face. If they don't melt your heart, then her eager, happy personality will.